A 60th anniversary party is a great celebration of a wonderful love story and your anniversary couple are bound to want to see their family and friends at the party. Before you start your party planning you will want to check that your couple want a big party or a more intimate family get together. Also have you thought whether they would like to renew their vows? A vow renewal service at their place of worship or even in their back yard would be a lovely way to start the celebrations. When you start looking for party decorations for this party you will find that there are very few actual 60th wedding anniversary party supplies, instead you will need to be more creative. You could use the traditional 60th wedding anniversary symbol of diamonds and use this as your theme. You can use diamond confetti for the tables and you can also use diamond embellishments as part of your floral centerpieces. These diamonds are on wires and can be added to the center of roses or other sturdy flowers. If you need to add extra sparkle in the room then you could add fairy lights and have them strung around the room. You could also use more traditional 60th anniversary party ideas for your theme and make it beautiful with lots of flowers or balloons on the tables. The decorations that you choose will depend on the style of party that you are having. 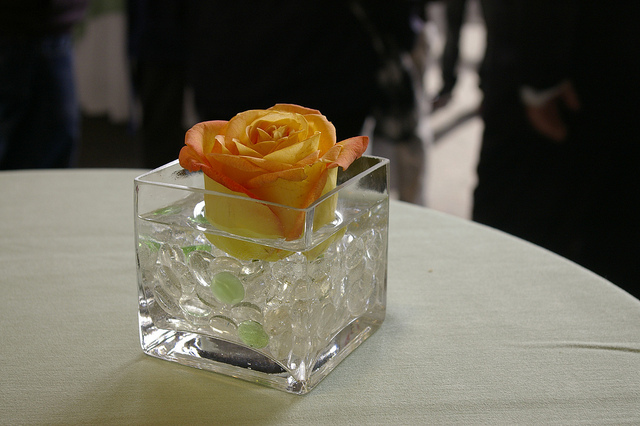 A more formal lunch would look great with flowers and a dinner could have candles on each table. A diamond candle centerpiece could be with floating candles and glass beads that look enough like diamonds. Use cylinder vases or a glass bowl and fill the base with the glass beads then add the water and place the floating candles on top. If you have used the cylinder vases then you could have a group of 3 of different heights in the center of the table and scatter some more of those diamonds around the table. 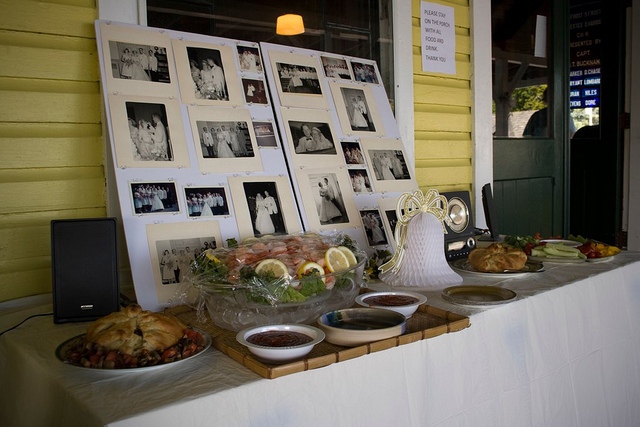 With all 60th anniversary parties you need to have photos and lots of them. One very sweet way to display them is to have your very own timeline around the room with photos from each of the decades. You could start at the courtship and the wedding and work your way to today. Or you could have the photos grouped into major milestones - engagement, wedding, children, fun and today. You may want to have a photographer on the party day to capture the latest fun times. Although your 60th wedding anniversary has the symbol of diamonds there is no way that these are going to be the favors for your party. Instead your favors are a reminder to your guests of the day that you have shared together. You could have seed favors where the seeds are for the anniversary couples favorite flower, or flowers that have the word diamond in them. You can find seed papers that are great for favors as there is less mess and these papers can be printed on, so you could have your thank you for sharing our special day or your names and the dates printed onto the seed paper. A mini photo frame would also be a very useful favor as your guests could then use them to have a photograph from the 60th anniversary party in the frame. Fun 60th anniversary party ideas for your favor are if your couple have a favorite recipe or if they are famous amongst the guests for the best chocolate cake then you could have the recipe printed out for each guest to take away. If it is a spicy dish then you could have a bag of spices attached to the recipe. There are also specific 60th anniversary party favors, here is a collection of anniversary party favors that would be perfect for your party.